Much Mississippian art has obvious stylistic and symbolic similarities with Native American art dating back a few thousand years. Serpents, falcons, water-birds, turtles, frogs, and beavers appear in sculptures and engravings during the Woodland period throughout southeastern North America. Other symbols and styles are wholly Mississippian. The spirals of Ramey-incised pots, human figurines, falcon-men, chunkey-stones, representations of maize and squash, elaborate supernatural serpents, and the cross-in-a-circle are all notable in Mississippian art. All of these representations provide clues about Mississippian perceptions of their social, natural, supernatural worlds. While the focus here is on Mississippian art from the American Bottom, particularly that from Cahokia, examples from throughout the Mississippian world are offered to flesh out particular artistic styles, motifs, and beliefs. The potential significance of the images, and motifs presented here are based on the analysis of Mississippian art from throughout eastern North America. As such, the meaning of Mississippian art, particularly the function of its socio-political and religious imagery likely has a fair degree of accuracy. 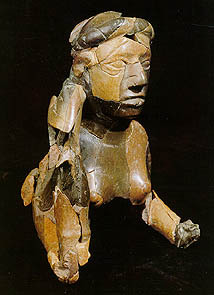 Presently, however, we have a poor understanding of how Mississippian art and its meanings changed in time and space. Did water symbols such as frogs and fish, for example, carry the same meaning for Mississippian people at different times and locations? Exploring the details of the relationship between Mississippians' art and their belief system remains a fruitful area of investigation.